Sir George Carteret, as depicted here was a staunch supporter of both Charles I and Charles II. His unqualified loyalty to both father and son during the Civil War and his most generous hospitality towards the then young Prince Charles during his stay at Elizabeth Castle found him awarded the roles of the Vice-Chamberlain to the King, Treasurer of the Navy and member of the Privy Council upon the Restoration of Charles II. Several wonderful websites offer excellent short biographies or stories related to Carteret including: 1911 Britannica; Wikipedia; Jersey Evening Post; and his Descendent Chart. Carteret’s famous years at Jersey, where he defended the Island in the name of Charles I, declared Charles II King, and ran a lucrative Privateering campaign are captured in the 1896 book by the Reverend Alban Ragg A Popular History of Jersey, chapters XII-XV. For those interested in more information on Island of Jersey during the years of Sir Philip Carteret, George’s Uncle and father of his wife, Elizabeth, a selection from the book Jean Chevalier and His Times Prior to the Great Rebellion is available online. The site hosting this book extract is home to Le Cercle de Carteret who have extended an offer for ‘Family and Friends’ of the Carteret’s to take part in their upcoming activities, as updated on their site. There was not much sentiment about George Carteret. He knew what he wanted and was determined to get it. A great sailor and a faithful servant to the King and the Royal Cause, he realized that, when he became Lieutenant-Governor and had taken up duties in the Island, he would be in a very dangerous position, and that if he failed, the Parliamentarians would show him little mercy. He was a much stronger character than his uncle, the late Sir Philip [who had role prior to him], but had the same accumulative tendencies and was very fond of power and riches and, later on, was known in England as the rich Sir George. He was very brave and had very considerable organizing ability and he allowed few scruples to interfere with his plans for the good of the cause he had at heart, and he was determined to grant stern justice to those who, during the last year of his uncle’s life, had treated him so badly. The Parliamentarians had little encouragement to submit their grievances to his sense of justice. He would admit of no grievances and considered that for their past actions they deserved utmost penalties. Many fled from the Island, but during the next eight years those remaining could get little assistance or support from the English Parliament. Sir George was all powerful in Jersey and, in all his actions, was supported by the members of the States who were always ready to follow his lead. Therefore he was always careful before taking any action in the Island to see that his conduct was in accordance with the legal procedure of the Island. Therefore until 1651 he was the Dictator of the Island, and maintained the honour of the Royalist cause and, gathering together a number of ships and manning them with gallant mariners, he was able to spread terror among the English vessels trading to and from English ports, in the English Channel. It is only a great man who could have done what he did in keeping the Royal Standard flying for nearly three years after the execution of Charles I, and historians in the past have done little justice to the gallant stand made by Sir George and his supporters in the little island of Jersey, a stand which required the greatest Admiral, Blake, with seventy ships and three thousand men to put down, and then only after Sir George had been granted full honours of war. Notwithstanding his many faults and his lack of sympathy in his dealing with opponents, who were not faultless, he may be considered as one of the greatest leaders during the Civil Wars, and the Royalist stand in Jersey as one of the great epochs in history. Sam’s early assessment of Carteret is that he is a “good-natured man’ and notes he is well positioned among other noteworthy individuals in the Kings’ Coronation Procession. Sam’s early Naval involvement with Carteret includes preparation of a letter for the Duke of York summarizing the poor financial state of the Navy; examining the Treasurer’s accounts; getting money from the Duke of York ;paying off ship debts; and happily recording his belief that Carteret is pleased with him. An argument between Carteret and Mr. Coventry causes Sam angst and starts a string of Diary entries about Coventry’s bad feelings towards Carteret. Two months later, Sam records with happiness that Carteret has put in a good word with the Lord Chancellor on his behalf. Conflicts arise in 1663 with a great dispute over the valuation of pieces of eight and Sam talks against Carteret. Further discord takes place over issues with the mast contract causing Sam to craft a letter to Carteret. A rather mistrusting Sam gets a vote of confidence from Carteret on the mast issues, and the two finally come to a positive understanding of each other. Sam is delighted to hear from Carteret that the Navy is finally out of debt. Sam and Carteret find themselves collectively embroiled with an angry Lord Chancellor over issues related to the taking of trees from Clarendon Park for use by the Navy. Any angry Clarendon rages to Sam about Carteret and the issue continues in Carteret’s disfavor with Clarendon. The relationship between Sam and Carteret will grow both professionally and to some extent, personally. As the Diary proceeds, Sam will find himself involved in more of Carteret’s personal life and family matters, which he will splendidly record. He will also find himself witnessing the fall out the record keeping issues of the Dutch War, where Carteret will become the target of accusations. As a result of these accounting issues, Carteret will be censured by parliament and in 1667 will leave his role as Treasurer of the Navy and will become the deputy Treasurer of Ireland, and no longer involved with Sam in the remaining years of the Diary. Biographies and related non-fiction about Sir George Carteret are listed below. Carteret kept a Journal during his trip to the Barbary Coast in 1638, which was printed in limited edition in 1929. Jean Chevalier, a Jersey man, kept a wonderful diary during the years that Sir George was Governor of the Island. The original is in French but the Saunders books draws heavily on the Chevalier Diary. These books may be available through your local library (with the help of the research department) or are sometimes available through the used book search. Some may be available on the US Amazon or UK Amazon. This text was copied from Wikipedia on 17 January 2019 at 6:04AM. Vice Admiral Sir George Carteret, 1st Baronet (c.1610—18 January 1680 N.S. ), son of Elias de Carteret, was a royalist statesman in Jersey and England, who served in the Clarendon Ministry as Treasurer of the Navy. He was also one of the original Lords Proprietor of the former British colony of Carolina and New Jersey. Carteret, New Jersey, as well as Carteret County, North Carolina, both in the United States, are named after him. He acquired the manor of Haynes, Bedfordshire (alias Hawnes) in about 1667. Carteret was the son of Elias de Carteret and Elizabeth Dumaresq of Jersey, who both died in 1640 (George dropped the "de" from his surname when he entered the English navy, concerned that it sounded too French). He was "bred for the sea" and served as an officer in various naval ships in the 1630s and commanded the Mary Rose before becoming Comptroller of the Navy in 1641. As a result of his early life at sea, he received little or no formal education, and his embarrassing ignorance was a source of much ridicule in later life. Andrew Marvell mocked his poor command of English, and Samuel Pepys remarked that his ignorance of even the most basic Latin phrases would cause a schoolboy to be whipped. "Such ignorance is not to be borne in a Privy Councillor', wrote Pepys severely. On the commencement of the Civil War he retired from the navy, and withdrew with his family to Jersey, but subsequently returned to aid the projects of the royalists. He afterwards, on the ruin of the royal cause, afforded an asylum to the Prince of Wales (Charles Stuart) and other refugees of distinction within his government of Jersey, where he served as Bailiff (1643–1651), and defended the island against the Parliamentarians, the Island in October and then Elizabeth Castle surrendering in December 1651. George Carteret also had Charles II proclaimed King in Saint Helier on 17 February 1649, after the execution of his father, Charles I. Charles II never forgot this gesture. However, he had to surrender Jersey to the Commonwealth of England. He then went into exile in France, where he was imprisoned in 1657 and then exiled from there, after which he went to Venice. The warmth and kindness with which he received the refugees earned him a permanent place in the King's affections, and also the friendship of Edward Hyde, 1st Earl of Clarendon, the King's chief adviser during his exile and for the first few years after the Restoration. Carteret was sworn into the Privy Council, appointed Vice-Chamberlain of the Household, and constituted Treasurer of the Navy. His career for the next decade is documented in the diary of Samuel Pepys, who joined him as Clerk of the Acts to the Navy Board in 1660. In 1667, he exchanged his office as Vice-Chamberlain with Lord Anglesey for that of Vice-Treasurer of Ireland, an office which he sold in 1669 for £11,000. His influence seems to have been at its height in 1665, when he boasted to Pepys that the King did nothing without his knowledge; however, as the naval war dragged on, the Treasurer of the Navy was an obvious target, and Pepys noted that by the spring of 1666 Carteret was being attacked on all sides. By the autumn of 1667, he confessed to Pepys that he was longing for the quiet of retirement. As Treasurer he was hard working and free from any suspicion of corruption, although his colleagues at the Navy Board complained that they found his accounts difficult to follow. The fidelity with which Carteret, like John Berkeley, 1st Baron Berkeley of Stratton, had clung to the royal cause, gave him also great influence at court: he was close to Clarendon, and to the Earl of Sandwich, whose daughter married Carteret's eldest son. He had, at an early date, taken a warm interest in the colonization of America. In recognition of all the help given to him during his exile in Jersey in the 1640s, Charles II gave Carteret a large grant of land previously named New Netherland, which was promptly renamed New Jersey under his charge. With Berkeley, he became one of the proprietors of the Province of Carolina prior to their becoming jointly interested in East Jersey. Carteret County, North Carolina and town of Carteret, New Jersey are named after him, and the city of Elizabeth, New Jersey, is named after his wife. In 1665, Carteret was one of the drafters of the Concession and Agreement, a document that provided freedom of religion in the colony of New Jersey. It was issued as a proclamation for the structure of the government for the colony written by the two proprietors, Lord Berkeley and Sir George Carteret. In 1669, he faced expulsion from the House of Commons to which he had been elected in 1661 to represent Portsmouth, for misconduct as Vice Chamberlain, being accused of embezzlement. After an announcement from the king expressing his satisfaction with Carteret and an acquittal by the House of Lords, the inquiry against him lapsed. He was in fact generally regarded as an honest man. In 1673, he was appointed one of the Lords of the Admiralty, and continued in the public service until his death on 14 January 1680. Shortly before Carteret's death, the king proposed to give him the title Baron Carteret, but Carteret died too soon, so the honour was granted to his grandson George. Philip (1641–1672), their eldest son, married Lady Jemima Monague, daughter of Edward Montagu, 1st Earl of Sandwich, and had four children: his eldest son George was raised to the peerage. Philip was killed at the Battle of Sole Bay, along with his father-in-law; Jemima had died in childbirth in November of the previous year. George (died 1656), who died unmarried. Caroline, who married Sir Thomas Scott of Scot's Hall, son of Edward Scott and Lady Catherine Goring, daughter of George Goring, 1st Earl of Norwich. Elizabethtown, North Carolina is named for Elizabeth de Carteret, the wife of Sir George Carteret. Samuel Pepys liked and admired Lady Carteret "the most kind lady in the world." New Jersey Archives, First Series. Newark, NJ, 1880–1893, Volume 1, page 25. Whitehead, William Adee, East Jersey under the proprietary governments. New York, New-Jersey historical society, 1846, page 104. O'Callaghan, ed., Documents relating to the Colonial history of the State of New York, 1849–1851. Volume 2, page 410. Marvell, Andrew, The poems and letters of Andrew Marvell; edited by H. M. Margoliouth. 3d ed. rev. by Pierre Legouis with the collaboration of E. E. Duncan-Jones. Oxford, Clarendon Press, 1971. Firth, C. H.; Knighton, C.S. (reviewer) (January 2008) . "Carteret, Sir George, first baronet (1610?–1680)". Oxford Dictionary of National Biography (online ed.). Oxford University Press. doi:10.1093/ref:odnb/4803. (Subscription or UK public library membership required.) The first edition of this text is available at Wikisource: "Carteret, George". Dictionary of National Biography. London: Smith, Elder & Co. 1885–1900. Henning, Basil Duke (1983). The House of Commons, 1660–1690. III. London: Secker&Warburg. p. 30. ISBN 0-436-19274-8. ^ a b c d e f Firth & Knighton 2008. ^ Jansso, Maija. Art and Diplomacy: Seventeenth-Century English Decorated Royal Letters to Russia and the Far East. BRILL, 2015. p. 204. ISBN 9789004300453. ^ "A Short History of New Jersey". State of New Jersey. State of New Jersey. Retrieved 6 July 2016. ^ DePalma, Anthony. "If You're Thinking of Living in: Elizabeth", The New York Times, 28 August 1983. Accessed 21 December 2011. "Elizabethtown, as it was originally called, missed the Elizabethan era by just 60 years and, in any event, the Elizabeth for whom it was named was not the queen but the wife of Sir George Carteret ..."
^ Henning 1983, p. 30. ^ Edward Scott for many years denied that he was the father of any of Catherine's children, on the ground that he and his wife had lived apart almost throughout their married life, but ultimately acknowledged Thomas as his son. ^ Gannett, Henry (1905). The Origin of Certain Place Names in the United States. Govt. Print. Off. p. 116. Sir George Carteret, born 1599, had originally been bred to the sea service, and became Comptroller of the Navy to Charles I., and Governor of Jersey, where he obtained considerable reputation by his gallant defence of that island against the Parliament forces. At the Restoration he was made Vice-Chamberlain to the King, Treasurer of the Navy, and a Privy Councillor, and in 1661 he was elected M.P. for Portsmouth. In 1666 he exchanged the Treasurership of the Navy with the Earl of Anglesea for the Vice-Treasurership of Ireland. He became a Commissioner of the Admiralty in 1673. He continued in favour with Charles II. till his death, January 14th, 1679, in his eightieth year. He married his cousin Elizabeth, daughter of Sir Philip Carteret, Knight of St. Ouen, and had issue three sons and five daughters. Carteret, Sir George , c. 1610–1680, proprietor of East Jersey (see New Jersey ). He served in the British navy, fought for the royalists, and became (1643) lieutenant governor of his native island of Jersey. In 1663, with several others, he was granted the proprietorship of Carolina and in 1664, in conjunction with Lord Berkeley, was granted part of New Jersey. His widow sold his claim to 12 purchasers who joined with 12 others as the 24 proprietors of East New Jersey. There is a borough of Carteret in New Jersey (across the Arthur Kill from Staten Island). There was also a Carteret County in South Carolina (another colony George Carteret was involved with) but after being founded in 1685, it changed its name to Granville in 1708. But there's a Carteret County on the coast of North Carolina. The house of C. doth have Sir Geo. up in front of their committee, but there be no 'CNN' to tells us of his Grilling. When Carteret was Governor of East Jersey he was involved with trying to prevent Edmund Andros from invading and annexing NJ from NY. He failed and Andros ran the place until James II was deposed. From the July 17, 1663 entry. Another interesting point is that “no scandal marred his record”, so the libertine court of Charles II and the loose morals of the time did not seem to be a pull to him as there are no mentions of mistresses and his love letters to his wife during their courtship have a nice sincerity to them. Sir George Carteret had originally been bred to the sea service, and became Comptroller of the Navy to Charles I., and Governor of Jersey, where he obtained considerable reputation by his gallant defence of that Island against the Parliament forces. At the Restoration, be was made Vice-Chamberlain to the King, Treasurer of the Navy, and a Privy Councillor, and in 1661 was elected M.P. for Portsmouth. He continued in favour with his sovereign till his death, in 1679, aet. suae 80. He married his cousin Elizabeth, daughter of Sir Philip Carteret, of St. Ouen, and had issue three sons and five daughters. CARTERET, Sir GEORGE (d. 1680), governor of Jersey; of an old Jersey family; lieutenant in the navy, 1632; captain, 1633; second in command against the Sallee pirates, 1637: controller of the navy, 1639; offered a command by parliament, 1642; from St. Malo, Brittany, sent supplies and arms to the royalists in the west and in the Channel islands; sent by Charles I to Jersey, 1643; reduced the island; sent out privateers against English ships; gave a refuge to royalists, 1646; created baronet, 1646; granted estates in Jersey and America, 1649; surrendered to the Commonwealth forces, December 1651; vice-admiral in the French navy; imprisoned, August 1657; banished from France, December 1657; withdrew to Venice; treasurer of the navy, 1660-7; vice-chamberlain of the household, 1660-70; M.P., Portsmouth, 1661-9; a proprietor of Carolina, 1663; deputy-treasurer of Ireland, 1667-73; board of trade commissioner. 1668-72; naval commissioner, 1673-9. Sir George Carteret, Baronet, a Frenchman, vice-chamberlain to the once treasurer of Ireland, and the navy, in which two places he cheated the crown of 400000l. as upon account was made apparent. He has wisely conveyed great part of his estate beyond sea, therefore deservedly made a privy counsellor. 1610-1680. A staunch supporter of both Charles I and Charles II. At the Restoration he was sworn into the Privy Council, appointed Vice-Chamberlain of the Household (1660-70), and constituted Treasurer of the Navy (1660-7). 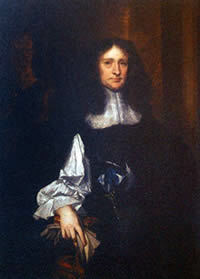 He also became Baronet Carteret & Hawnes and was MP for Portsmouth (1661-9).